I am headed to Hartford, CT on Sunday and I have very mixed feelings about it. On one hand, it's such an honor to be asked to go and represent my team in and I am going to get tons of face time with some really important executive's that could very well help me further my career. I love my company and would really like to stay here and work my way up the ladder where I could really make a difference. I've never been to Connecticut either so that is a treat and in addition - there are some friends there that I wasn't sure I'd ever see again that now I am going to get to visit with. Now.... all those pluses are counteracted by one thing. One HUGE thing!!! Leaving my family. Leaving my small children and husband alone to deal with it all... I actually told my oldest on the way to preschool today that I was going to have to go on an airplane for 3 days again and she immediately burst into tears. My heart broke. And I mean broke in half. 3 days is a long time to them.... And I am sure they are wondering why I have to go. It's so hard balancing real life (meaning work) and REAL life (meaning home). I want the girls to know that they can have it all - the family, true love, work they can be proud of and self confidence that doesn't mean having to give one thing up to be the best at the other. But I also want them to know that it hurts terribly when I have to make decisions like this. But I ALSO want them to not be scared so I have to act like going for 3 days isn't a big deal. It is such a balancing act. Either way, I have already committed to going and it really isn't something (from my bosses point of view) that I could ever turn down. So, I will get in my cab on Sunday with tears in my eyes, remorse in my heart and guilt on the sleeve and I will pretend to be on my top game in Hartford with confidence and poise. And counting down to Wednesday evening - when I can be home again. So, there is like a million things to keep up with these days.. It's like a never-ending fly buzzing around in your ear. But I am not above it - I love it as much as anyone and I am as addicted as the next. Where do you draw the line??? It's just so much fun peering into the lives of others and learning about their day-to-day- understand you are not the only one..... I actually feel connected to some. Like true friend connection. Especially to the mothers. I know I am going off in too many tangents here but the point is... I know there are too many outlets and its too much to keep up with.... but if it gives you a connection and keeps you sane and lets you know you are not alone... isn't it worth it? I went to breakfast at Cracker Barrel with the kids and my mom and sister Saturday morning. 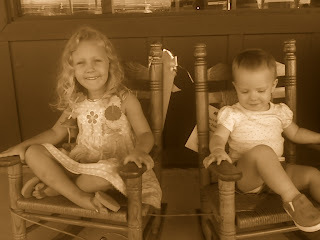 They had so much fun running around outside and playing on the rocking chairs. Then we went shopping all around Alamo Ranch and I got some shoes and 2 news dresses and too many clothes for the kiddos. 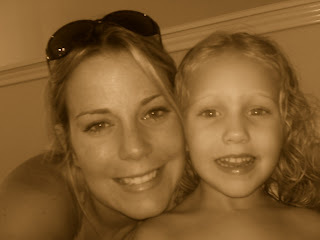 Yesterday I took Addison swimming (just her and me) at the neighborhood pool. We had a good time. I am tempted to start her in swim lessons so she will get more brave being in the water alone but can't decide if I want to pay for it. I hear arguments for both sides... I think if Addison had a friend to "compete" with... it might motivate her. I am not being as good as I was with the working out/eating since the end of the contest. I plan to start back today (OK - tomorrow). I was really lazy the last 2 weeks though and probably gained back half of what I lost but I'm not sure as I haven't weighed. I know, I know. It's bad. Whipping back into shape. Well, the month of June just flew by and I have been pretty much terrible at updating the blog lately... I promise I am going to do better.. if anyone is even reading anymore.. Not sure they are. No one comments like they used to... can't blame them. ha ha! The 4th of July was a super fun holiday spent eating, drinking and swimming with family! The girls had a blast and Thomas and I got to go out and spend some grown-up time for his 31st birthday! And I got to meet the infamous "boyfriend" of my sister's. 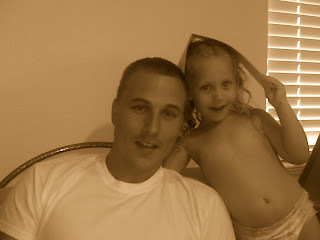 He was pleasantly normal and seems to really like her so it made me happy! Kirstynn is finally starting to say more words! We hear mama, dada, sister, nana, grandad and what's that.... She is so different from her sister though. So much more introverted and cuddly. It's sweet. I just found out I have to travel for a few more days at the end of July.. this time to Hartford, CT. So much for no travelling but its a great opportunity and I am excited that my bosses picked me! Ok, more updates to come soon!